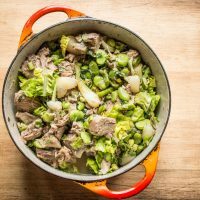 Tender pieces of grass-fed lamb shoulder, with a big, bountiful mix of vegetables in broth makes a rich, healthy meal. 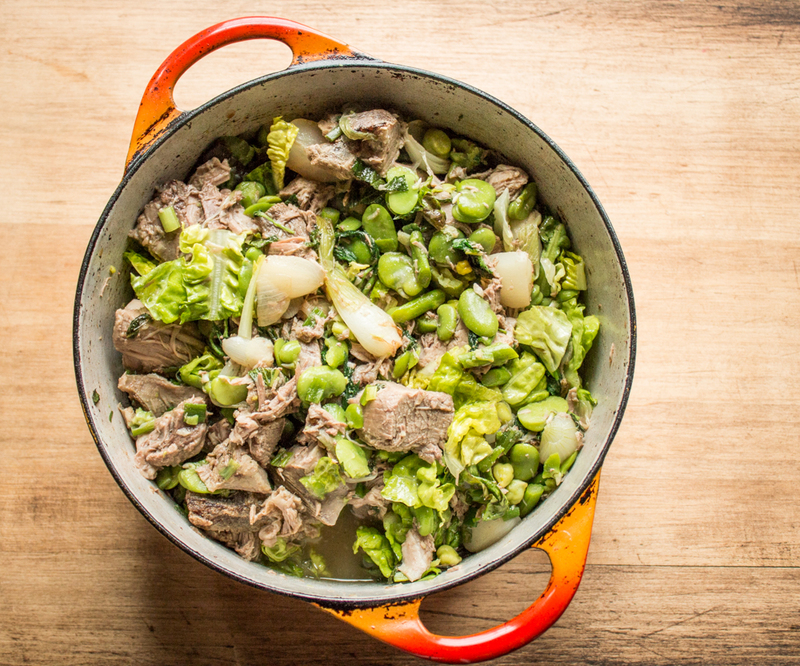 The stew is called Hotch Potch, and it may sound like a children’s game, but it’s actually a traditional Scottish vegetable stew featuring lamb or mutton. In this recipe, Chef Alan Bergo uses lamb shoulder, but many other slow-cooking cuts could be used too. Chef Bergo discovered an old recipe for Hotch Potch, and decided to create a modern version that still keeps the basic principles of the original. 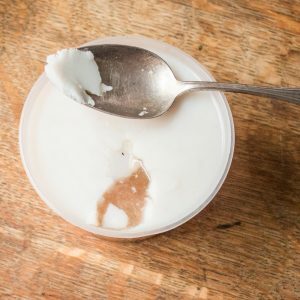 In times of food scarcity, the stew could be made with garden vegetables that were available, but also wild vegetables that one could gather, specifically wild onions, lovage, and nettles. As a forager, Chef Bergo is no stranger to wild, edible plants, but to make things approachable, and possible for home kitchens, he features only one wild ingredient: nettles, along with a selection of vegetables you might find as Spring changes to early Summer. 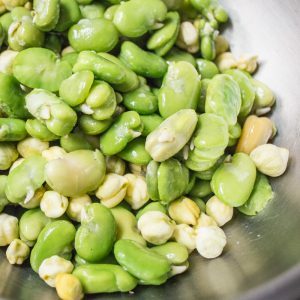 Chef Bergo uses endamame, fava beans, lettuce, asparagus, spring onions, and turnips in his version, but you should feel free to use whatever is on hand, and very fresh. Yield is enough to serve 4 as an entrée. The finished pot of Hotch Potch. This recipe is by chef Alan Bergo. A chef from Minnesota, Alan is a veteran of the culinary industry, former executive chef of Lucia’s, and the Salt Cellar. 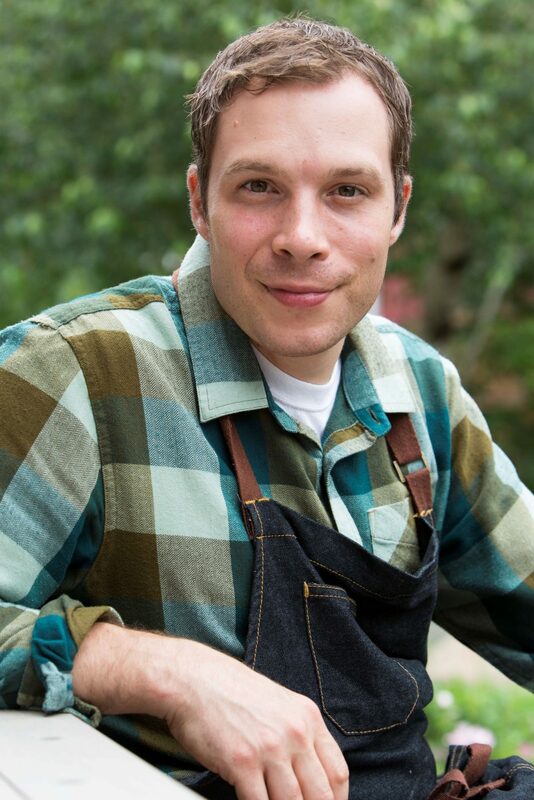 Founder of the website Forager Chef, he’s best known as a authority on cooking with wild food. Learn more about Chef Alan, and his hunt for mushrooms, wild and obscure foods at Forager Chef. Shelling legumes for the hotch potch. Trimming cooked, chilled, lamb shoulder into pieces. 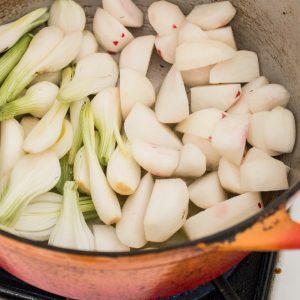 Cook firm ingredients first, like radishes, turnips and raw onions. Scrape fat off the chilled stock before assembling the final dish. Put the stock and lamb shoulder in a casserole with a lid, cover with a piece of parchment and a lid. Cook the lamb shoulder for 2.5 hours or until tender, then cool for an hour and refrigerate until the fat has risen to the surface of the pot and the lamb is stiff, which will make sure it doesn’t fall apart when it’s cut. 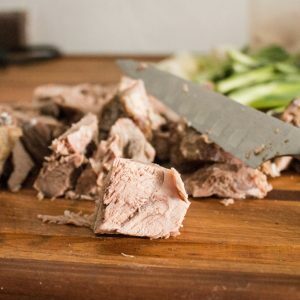 Remove the chunks of fat from the pot (it will remove easily) then transfer the lamb to a cutting board, pat dry, and with a paring knife, carefully remove the fat cap, and then the bone. Cut the lamb into 1 inch pieces and reserve separately from the liquid. Next, prepare the vegetables and cook the stew. In a large sauté or cast iron pan, heat the oil, then add the spring onions and radishes and sweat until tender. Add the remaining vegetables except the lettuce and nettles along with the stock, and cook until the vegetables are just tender, covered, about 3-4 minutes, stirring occasionally to wilt the nettles. Season the vegetables with a good pinch of salt. Add the lamb to the pan along with the nettles and lettuce and heat through. Finally, add mint to the pot, stir to distribute, double check the seasoning for salt and pepper, adjust as needed, then divide the stew equally between 4 heated bowls, drizzling the stock over each portion and finishing with a sprinkle of chives. The stew should be very thick, with only a about ¼ cup of lamb jus per bowl. Serve with high quality olive oil at the table for drizzling over each bowl.